Bumper nerf strips Reproduction for Jeep Grand Wagoneer 1984-1991. These nerf strips have not been available for several years, we reproduced them identical to the original. Are you ready to boost your Grand Wagoneer's front end protection and make it the perfect to tackle the rugged trails and gnarly terrain with extra piece of mind by setting it with this top-end front bumper? Check out the best and affordable bumper nerfs at Jeep Cherokee Chief. Some Jtrucks use these protectors only on the front bumper. We have reproduced an identical texture, slightly granular, on the entire visible surface. The lateral fittings have also been reproduced. These products are manufactured in standard ABS ensuring the same flexibility as the original protectors. The internal reinforcement structures have also been reproduced in an identical manner. The various protector kits also incorporate all the elements necessary for assembly, including fixing screws which are zinc-plated metal. They have a specifically created thread (auto-threading) to be use in plastic (ABS), basic material of protectors. Since the screw housings in the guards have no screw threads, the tightening torque must be quite weak, and the screw may therefore rotate in a vacuum. 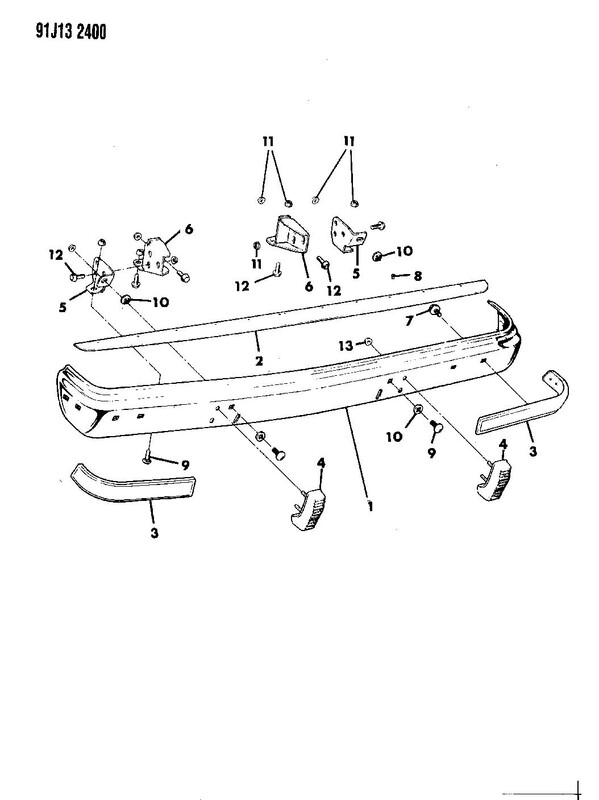 These protectors are intended to replace the original protectors used on Jeep Grand Wagoneer models SJ produced from 1984 to the final edition in 1991. They have also been used on the Truck versions for a few years. These protectors require no drilling of the bumper because they are compatible with the original holes. However, they are compatible only with bumpers having protectors in the first place. This must be taken into consideration, Jeep having sold, at the same time, less luxurious versions without bumper protectors. A magnificent complete kit faithful to the original product to replace your existing protectors in poor condition and guarantying a quality restoration. 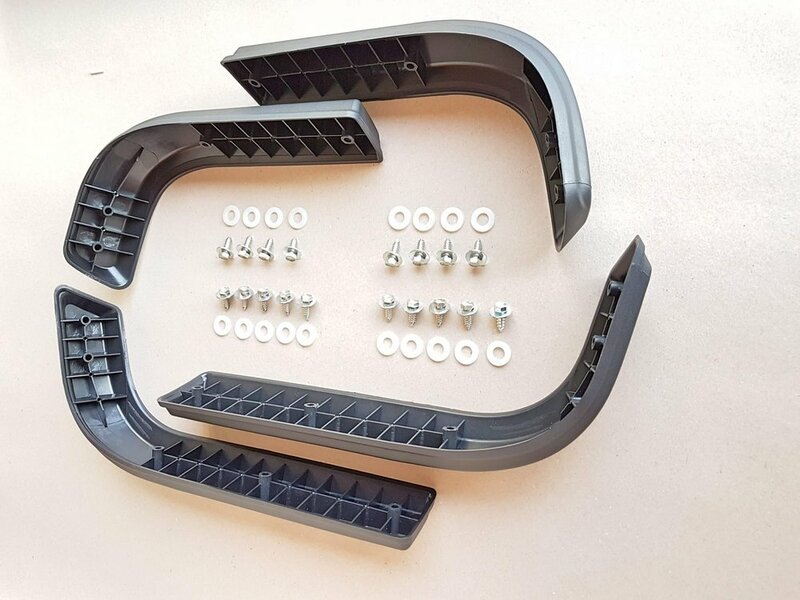 This complete kit for the front and rear, consisting of four different protectors, includes all mounting parts, 18 zinc-plated screws and 18 nylon washers. Each bumper nerf is manufactured with the best material and made to be tough as nails. These jeep front bumpers will keep your steel stallion safe from damage caused by flying rocks, deer, other vehicles, and everything in between while giving it a sharper, strong and sophisticated look. 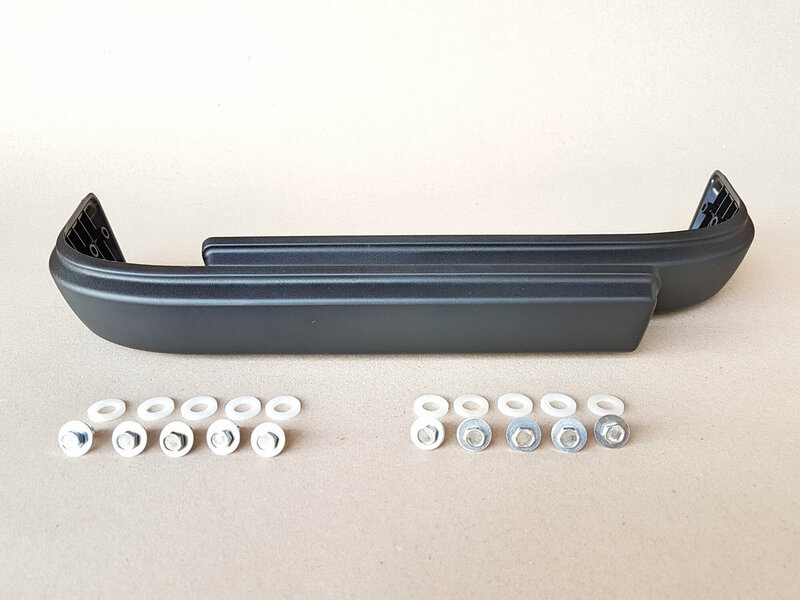 Bumper Nerfs Reproduction specifically caters to Jeep Grand Wagoneer 1984-1991. These bumpers nerfs have been unavailable for several years. 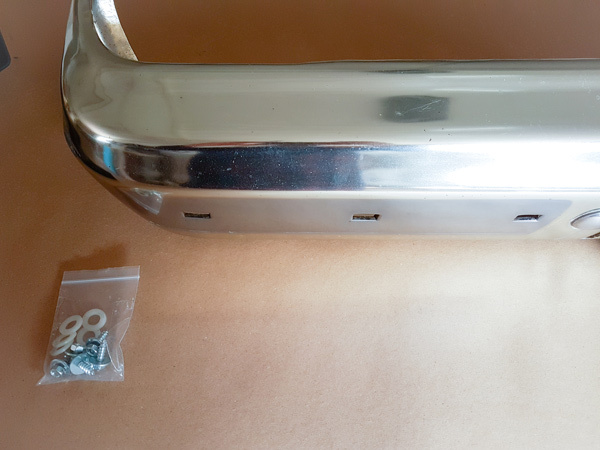 But JeepCherokeeChief Store has brought them back and reproduced Jeep Grand Wagoneer bumpers identical to the original. Each bumper is reproduced in an identical texture that is slightly granular on the entire visible surface. The lateral fittings on the bumper have also been reproduced. All front and rear bumpers are made from premium, durable materials for impeccable strength and durability. They are built to withstand the most wildest terrains and off-road adventures for years to come. 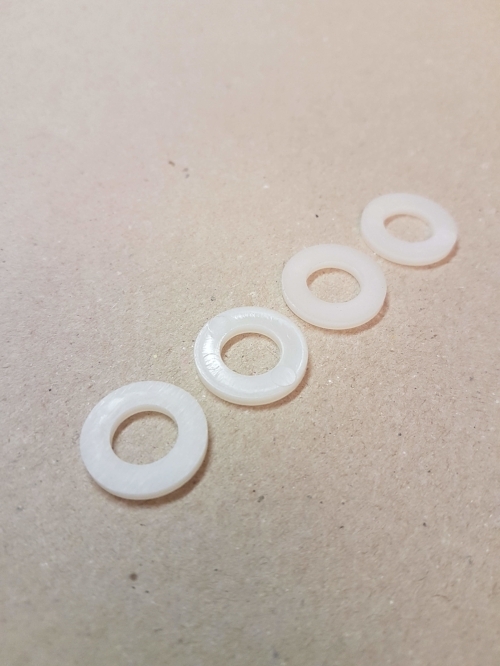 They are made from standard PE that guarantees same flexibility as the original protectors. 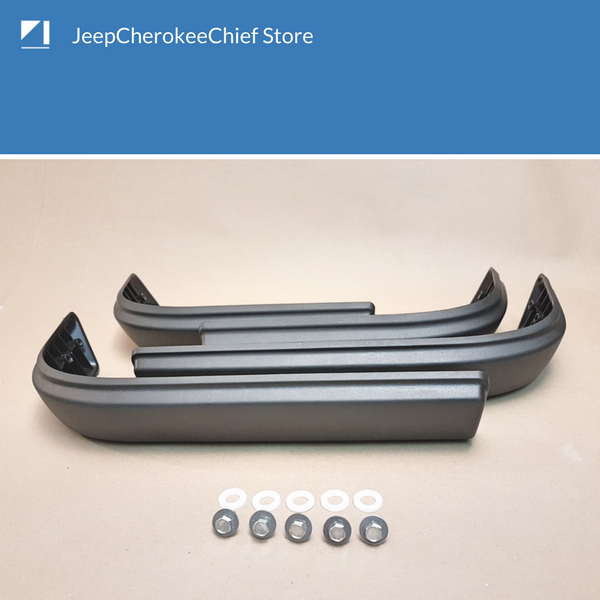 JeepCherokeeChief Store has meticulously worked on internal reinforcement structures so that they're reproduced in an identical manner. Revamp your stallion with the finest piece of body armor available that will not only stand up to the rugged roads ahead, but also add a sleek, aggressive look to your vehicle. 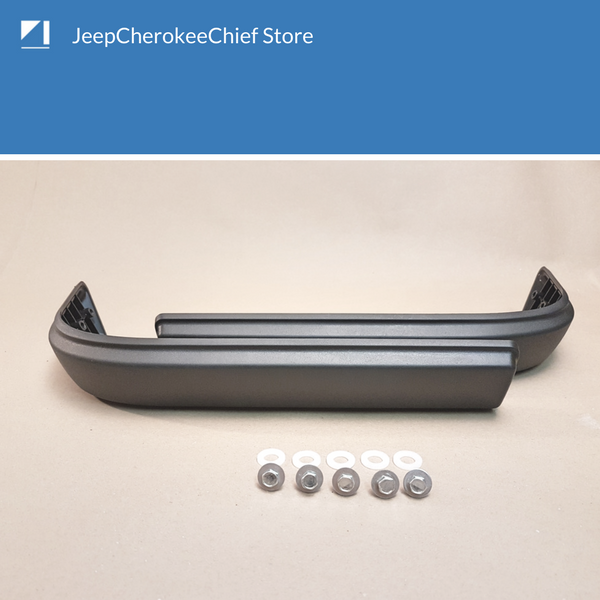 Jeep Grand Wagoneer Bumpers by JeepCherokeeChief Store combine style with function, this front bumper is the perfect choice for your off-road companion. The international stars of the jeep Full Size series restoration, trust us for the quality of our products. If you are looking for a vehicle already restored or parts for your jeep, do not hesitate to contact them directly. Phone: 253.320.7604 Call or Text! You are interesting to sell my product into your shop or webshop, contact us to discover the price discount and margin I offer. Before mounting your protectors, we advise you to read the following instructions carefully. Since the protectors are flexible enough, they will not immediately follow the curve of the bumper when you place them without screwing them. Only when all the screws of the kit are fixed that the shape will be perfectly followed. Push the protector against the bumper and screw at the same time without forcing. A slight clearance must exist to allow lateral movement necessary for assembly. Then, on the other screws without ever forcing the screw, always pressing the protector against the bumper and screwing in order to retain the protector. Depending on the state of the curvature of the bumpers, some spaces may appear. If during assembly you have used an unsuitable tightening torque and thus ruined the thread, tried to mount a larger diameter screw. Our bumper stripes are manufactured by injection molding. The plastic materials (PE) is softened, injected into a mold, and cooled. These are injection-molded in many manufactured products: automotive, household appliances, computer equipment, furniture, etc. Use a mold is the only one way to obtain an exact fit of the parts producted even after more 1000 items, that the reason why my part absolutely fit with your grand wagoneer or Jtruck. Our products are developed in #Switzerland, with some steps such as the manufacture of the mold and the pressing of the final parts outsourced to China. Packaging and quality control are all carried out in Switzerland, thus ensuring perfect quality. "I also have a classic vehicles #Jeep Grand wagoneer, Jtruck, my bumper stripes or nerfs are in bad shape, I have been looking for some for a long time, this product interests me very much."